John Cameron has risen to the top not only in the world of preservation, but in the professional rail industry, too. 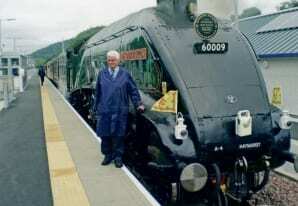 In this concluding part of his life story, the owner of Union of South Africa and The Great Marquess tells The RM how he rose from humble enthusiast to become chairman of ScotRail and a member of the BR Board. He was delighted to agree, especially as the deal allowed him to ride on the footplate, and the trip was a huge success. Once that unexpected bonus was over, a BR 350hp diesel shunter hauled the loco in April 1967 from Thornton to the Fife coast outpost of Crail, from where it was taken by low-loader along six miles of narrow winding lanes.